Panaji (Goa) [India], August 12 : The Indian Coast Guard Ship 'Shaurya', an indigenously built offshore patrol vessel by Goa Shipyards, was commissioned, on Saturday at Panaji, in Goa. The commission was inaugurated by Union Minister Dharmendra Pradhan, who expressed his gratitude for being a part of this joyous moment. "Today is an important day for all of us as one new ship 'Shaurya' will be stationed in the South Eastern part of India, that is, Chennai," Pradhan said. The Minister of State (Independent Charge) for Petroleum and Natural Gas also congratulated the India Coast Guard for success in preventing drug trafficking near the Gujarat Coast. 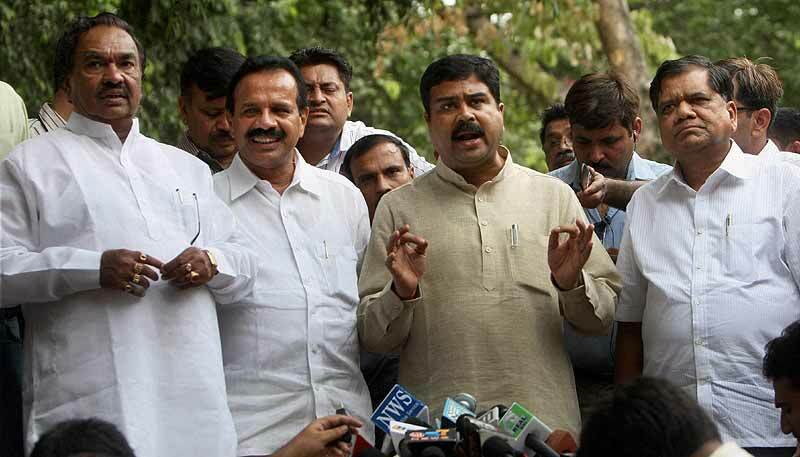 "I express my gratitude towards the Indian Coast Guard for protecting our offshore assets along the Western Maritime Borders including the Bombay High," Dharmendra Pradhan boasted. Addressing the media in Panaji, the Union Minister said that the Goa Shipyard has created an ancillary eco-system in Goa. Pradhan also said that he has requested the Goa Shipyard to initiate a pilot project to explore the use of compressed natural gas (CNG), liquefied natural gas (LNG) in ships like Shaurya and have talked to the GAIL to collaborate in the venture. Focussing mostly on creating Green Energy fuel, Pradhan said that this would also help to create Goa as a state for green fuel conversion. "Its size, availability of raw material will be favourable, while urban and marine waste would be converted," he added. He further said, "It is an engineering marvel with excellent coordination. The kind of modern technology used in Shaurya shows our competence in this field." "Our government is focussed to create new kinds of energies. Prime Minister Narendra Modi had announced to reduce the Carbon emission, even though India is not a major pollutant," he added. Talking about the renewable sources of energy that India is creating and is determined to create, Pradhan said, "Today the Indian Oil Corporation Ltd. Vasco Terminal received the first consignment of 2.16MT of premium quality defence grade ATF from the paradeep refinery." He further said that the government of India has planned to invest around Rs. 10,000 crore to Rs. 12,000 crore on RND of second generation ethanol. Earlier in May 2017, the Goa Shipyard Limited launched Indian Coast Guard ship 'Shaurya' at Vasco, the fifth of a series of six off-shore patrol vessels that the Coast Guard had tasked the Vasco defence public sector undertaking to build.